Masthead (title, logotype, logo or nameplate) The name of the magazine displayed in a specific typeface. This is the visual branding of the title and is often done in a specially designed typeface to be easily recognised and unique. The masthead – also called a title – is usually used on the contents page inside as well as the front cover, and as a logo for advertising and branding purposes. Titles for big magazines are often designed by specialised typographers such as Dave Farey and Richard Dawson(Good Food, Maxim, Design Week) and Matthew Carter (Private Eye). They may be tweaked to exploit new printing techniques; switch from full face to a body shot; use illustration rather than photography; move the target readership age up or down; or simply to freshen things up. Take a look at 4Girl covers for one example; or 3 covers from Record Mirror. Compare the cover above with Cosmo’s first UK issue in 1972. What’s changed and why? Pay attention to detail – does the cover image go in front of or behind the masthead? 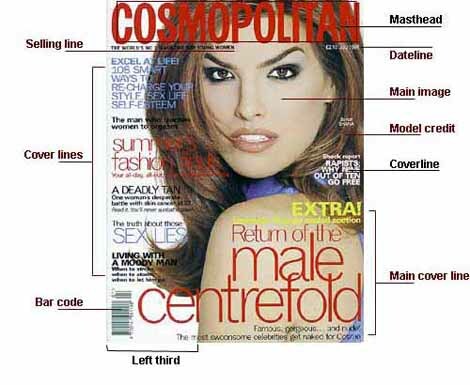 Why do you think Company‘s 2001 mastheadis so similar to Cosmopolitan‘s? The Financial Times tried to prevent London’sEvening Standard printing its business pages on pink paper. It failed, with the judge saying readers were unlikely to confuse the broadsheet FT with the tabloid Standard. Celeb weekly Hello! warning OK! not to copy its look. Red and Real clashed over their title designs, with the latter giving way and redesigning its masthead.Compare Red and Real here. historically, some consumer magazines carriedcover adverts, such as 1935 Bystander. The practice has carried on for some trade magazines, and is now coming back in the ‘freemium’ sector such as wraparound covers on Shortlist andStylist.